You are here: Home > News > Still a Jolly night - cheers for 12 years! Tottenham Hotspur may have won 4-0, but the result did not matter as more than 13,000 fans showed their support at Simon Rodger's testimonial. Crystal Palace were unable to see Simon Rodger out with a win tonight as Tottenham put four past Matt Clarke. Scorers for Spurs were Stefan Iversen with two, Darren Anderton (pen) and Davies. Rodger came off after 30 minutes to a standing ovation and replaced by youngster Wayne Routledge. Alan Pardew, John Salako, Geoff Thomas, Richard Shaw, Phil Barber and Steve Coppell were called out to the pitch at half-time much to the delight of the crowd. 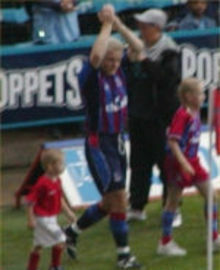 "Stevie Coppell's red 'n blue army" rang round the stadium. Jolly thanked the Palace fans and said he was proud to have played for a great club. He also praised Glen Hoddle and Spurs along with the organising committee for the match. It was a shame Rodger had to come off after only 30 minutes. Rodger should have played 88 minutes and former players should have been allowed to play, with Rodger getting the customary goal. This happens at normal testimonials! As for the game. Well the class between the Prem and the First Division was clearly evident tonight. Spurs, who are an average side, were made to look very good - slick passing and great finishes. Davies and Iverson played particularly well. Adebola looked like an awful lump with no first touch. Steve Thomson was anonymous as ever, Hayden Mullins was bad and Matt Clarke must be disappointed with one or two of the goals. Dougie Freedman oozed class, Routledge was superb and caused Carr all sorts of problems down the left wing. Definitely a star for next season. The result doesn't fill you with much hope for the season and another tonking looks likely against Charlton on Monday night. But who cares anyway. It was Jolly's night and we wish him the best of luck for the future. Cheers for 12 years. Palace: Clarke, Fleming, Granville (Frampton 77), Austin, Popovic, Butterfield, Mullins, Rodger (Routledge 29), Freedman (Black 77), Adebola, Thomson. Subs not used: Rubins, Kolinko. Spurs: Hirschfield, Carr, Taricco, Bunjevcevic, Doherty (Perry 46), Richards (Gardner 18), Anderton (Blondell 75), Davies, Iversen, Acimovic (Redknapp 43), Rebrov (Bo 60). Subs not used: Sullivan, Thatcher, Etherington.